Hordaland is known for its city Bergen, the second largest city in Norway – also called the “Gateway to the Fjords”. 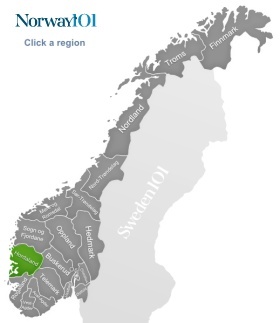 The second largest fjord of Norway can be found in Hordaland, and about 10 % of all Norwegians (around 500,000) live in this region of Norway, which makes it the third largest region in regards to population. 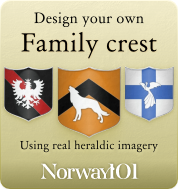 Hordaland is also one of the most multi-cultural regions of Norway with people from around 150 different nationalities calling this region their home. Hordaland is a region that is filled with beauty – like long fjords, stunning waterfalls, gorgeous forests, interesting glaciers – but also a region full of history, especially because the harbour of Bergen used to be a very important part of the Norwegian trade with the rest of the world. It wasn't until 1972 that Bergen became an official part of Hordaland. It used to be a county of its own, but later became part of the surrounding region. Bergen is the second most populous city in Norway, around 60% of all the people in Hordaland live either in or around Bergen. Bergen has a very interesting, and partially turbulent history. In the mid-14th century, the black death came to Bergen via a ship. Bryggen, the wharf of Bergen, is a UNESCO world heritage site, and the ideal place if you would like to learn more about the city's long history. While some of the wharf was destroyed in fires, many of the old buildings are still there. The first constructions on the harbour have taken place around the year 1100. In 1360, an office of the Hanseatic league was opened in the harbour, and by the end of the 14th century, Bergen had established itself as one of the most important centres of trade along the Hanseatic route, and was the centre of trade in Norway. Bergen still has quite a few old buildings even though the wooden buildings were quite prone to being destroyed in fires (and there were a couple of big devastating fires in Bergen's history). While there are quite a few interesting towns and villages along the attractive coast of Hordaland, Bergen is usually the first stop of many visitors as this is the place where you can learn most about the region's history, and it is also a very good base for exploring the rest of the region. The Hardangerfjord is one of the main attractions in Hordaland: it is the second longest fjord in Norway, and the third longest Fjord in the whole world. It can easily be accessed from Bergen, and the history of the Fjord stretches all the way back to Viking times (about which you can learn more in information centres about the fjords). Since the late 19th century, tourism has become quite important for the region as Thomas cook arranged weekly cruises for people from London. The spectacular landscape with its many waterfalls was just too tempting to resist. Unfortunately, some of the waterfalls are now used to produce power, so it might not look as naturally beautiful as it could be. The Hardangervidda mountain plateau is the largest national park in Norway, one of Europe's largest mountain plateaus, and home to Europe's largest group of reindeer. The animal and plant life in this beautiful region is very interesting, and if you take one of the very well sign-marked hiking tracks through the national park (there are tracks for all kinds of fitness and experience levels), then you will most likely be able to spot a few animals. While Vøringfossen might not be Norway's longest, highest or even strongest waterfall, it is most likely the most famous waterfall for tourists. It wasn't until the late 19th century that the waterfall became a tourist attraction: a hotel was built at the top of the waterfall. It was a scenic location with a minor drawback: you had to climb 1,500 steps to get to the hotel. The building materials that were needed to build the hotel all had to be taken up the hill on horseback, and it was quite an undertaking. Today, the access is a little bit easier though. You can find three major glaciers in the Folgefonna National Park, which was founded to protect the area around those glaciers. It is a great area to go skiing or snowboarding in winter, but exploring the glaciers is a very fascinating activity all year around – it's a different kind of natural beauty that you should experience at some stage in your life.